During the middle ages, church services (the mass) became more and more standardised. During this process of change, many local elements were lost. 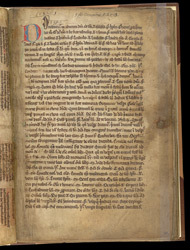 This manuscript is a type which can be of help in discovering, for example, which gospel readings and prayers were recited or sung on particular feast days during the middle ages. It is an ordinal, a book giving the beginnings of the readings, hymns and prayers for the performance of mass and the offices (the daily prayers said in monasteries and other religious houses). Elements of the services it gives suggest that it belonged to the cathedral of Hereford. The church year begins with Advent, the season before Christmas. The first page in the ordinal has readings for a Sunday in Advent. The page is packed with the short phrases which indicate the beginnings of each element of the service. It is written for a specialist who would be in charge of organising the services.